Mueskes Landscape and Snow Management can enhance your property with built-to-last granite curbing, steps, lamp posts and mailbox posts. 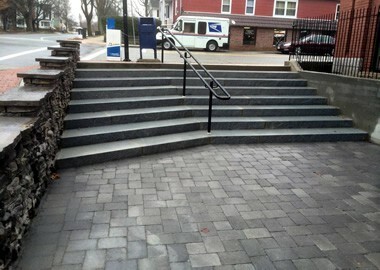 Enhance your property with clean and professional granite curbing, steps, lamp posts and mailbox posts. We have the equipment and experienced staff to excavate the existing area, provide all necessary base materials, install the stone and finish all disturbed with a clean landscape. 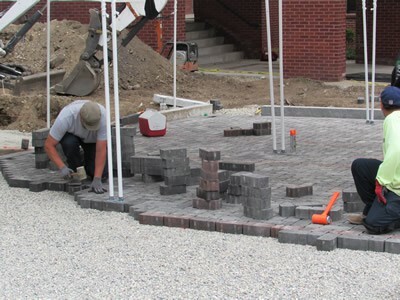 We will work from architectural plans or hardscape designs to ensure the installation is precise and meets all of your requirements. 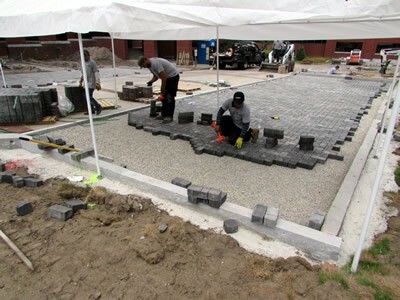 Mueskes Landscape and Snow Management takes pride in a long-lasting finished hardscape. 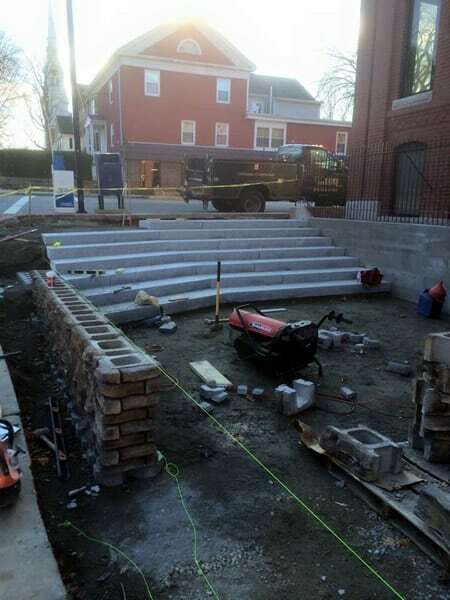 When installing granite curbing, steps and posts, we adhere to the same preparation and techniques as we do with other hardscape installations. 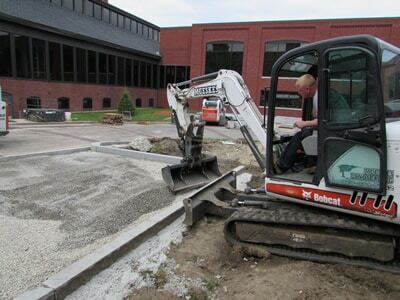 We are aware of the risk of settling and damage during the winter months, so we ensure adequate compaction and proper stone backfill or concrete setting of granite to prevent any disruption. 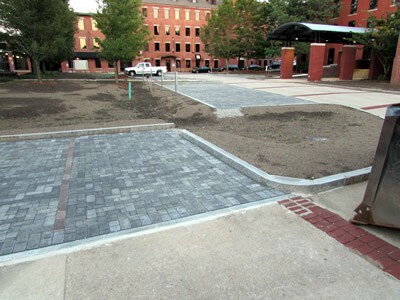 Featured below are photos from a parking lot installation and an entrance redesign and installation. 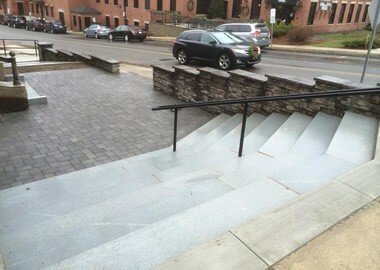 Products installed were permeable pavers, granite curbing, granite steps and caps, and a decorative retaining wall. PRIVACY NOTICE: All personal consumer information submitted through this website will be held confidential within the business. Mueskes Landscape and Snow Management specializes in commercial snow plowing, commercial snow removal, lawn mowing, lawn installation, sod, hydroseed, mulch, property maintenance, clean-ups, tree trimming and removal, landscape design, walls, walkways, patios, stairs, granite, irrigation, drainage, permeable paver systems and planting. Mueskes Landscape and Snow Management services properties throughout Northeast Massachusetts and Southern New Hampshire including Methuen MA, Andover MA, North Andover MA, Haverhill MA, Lawrence MA, Dracut MA, Tewksbury MA, Boxford MA, Newburyport MA, Georgetown MA, Groveland MA, Merrimac MA, Middleton MA, Chelmsford MA, Wilmington MA, Lexington MA, Salem NH, Pelham NH, Windham, NH Derry NH, the Merrimack Valley and Southern NH.